A very good friend of mine recently moved into a new house with an unfinished basement. There’s nothing that cries out Home Theater like a big empty basement with nothing in it. So naturally I offered to build this friend of mine a set of speakers to go into his soon-to-be-rocking new home theater. With a tight budget and the only criteria that the speakers had to pretty much rock for movies, I set out to design a medium-end LCR (left-center-right) speaker system to go into his wall next to his 78″ screen. He had already cut out holes in his wall to accommodate a pair of speakers I had mentioned wanting to build. The design changed since then but we were left with the same size cutouts in the wall, so I was on a hunt to pick out some drivers that would still fit in the allotted space – which was basically 8″ wide by 40″ high by as deep as we need. I originally was planning on doing an MTM design with a pair of Dayton 6″ Reference Woofers and 1″ reference tweeter. But when I ran the cost numbers it was a bit on the expensive side (we’re doing 3 sets of speakers so the final cost = everything needed to build times 3, and it adds up fast). In addition, we weren’t really looking for an audiophile-esque sound, since the speakers will probably never get used for any kind of dedicated 2-channel listening, and my friend just wanted something that plays movies, sounds decent, and plays loud enough to mate with his big 78″ screen. I looked at every 6″, 6-1/2″ and 7″ woofer Parts Express carries with an intent to buy one of the lesser expensive drivers, but didn’t want the cheapest one’s either. That’s when I ran across Dayton’s 7″ aluminum cone woofers which despite being only $18 a piece, really had some decent specs, low fs at 37Hz, a modern, clean look with a silver aluminum cone, nice rubber surround and some healthy Xmax at 4.25mm. PE recommends a 0.76 cu.ft. box tuned to about 32Hz for an f3 of 35Hz. I’ll double the box volume for our MTM design. The frequency response of these drivers looks very good up to about 1.5kHz, where there’s a slight dip and then the infamous cone break-up modes kick in at around 5-12kHz. It will be critical to get rid of everything above 2kHz in order to achieve decent sound out of these budget drivers that isn’t harsh and fatiguing. So with the right crossover, this driver should sound great and with a pair of them, our efficiency is up 3db from a single driver, as well the power handling doubles, so they should play nice and loud with his Onkyo receiver. More on the crossover design later. For the tweeters I did the same thing with the woofers, I looked at them all (this is where having PE’s catalog really comes in handy). Clicking around the Internet can be tiresome, even at cable modem speeds, but a catalog I can browse specs of multiple drivers all at a glance and with ease. Some of my favorites tweeters I’ve used on several speakers are made by Vifa and Morel. They offer low-cost, high-performance tweeters and have detailed data sheets including FR and Z plots, which are critical for designing any kind of decent crossover. So after going back and forth for days on Vifa and Morel, I settled on the popular Morel MDT-20. 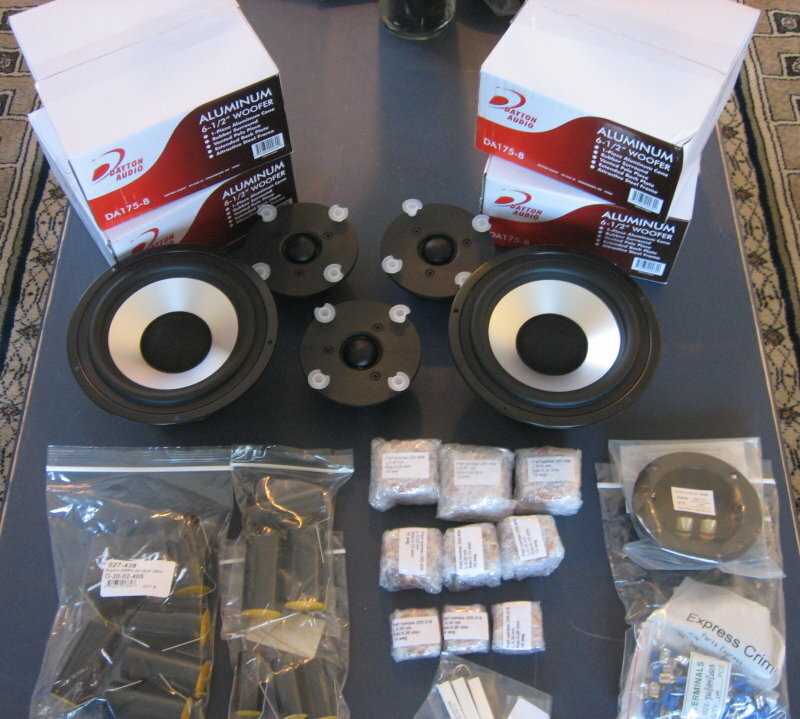 It’s a 1-1/8″ soft dome tweeter with the high efficiency I need to match up the the pair of 7″ woofers, has a very low fs (650Hz) which will allow me to set the crossover point below 2kHz without damaging the tweeter and keep those woofers operating in their optimally flat region. The cost of the MDT-20 is just right for our budget and should be a great tweeter for this set of MTMs with a flat, on and off-axis, frequency response. Anyway, I’ve gone on enough about that, here’s a quick picture of the box of goodies that showed up on my doorstep today. The 7″ aluminum woofers look great. The stamped steal frame is cheap, I would have preferred cast baskets, but aesthetically they look great. And the Morel MDT-20 really looks sharp with its super delicate fabric dome and large rear cavity. The plastic faceplate isn’t quite as fancy, but again for the cost, it should be a great tweeter and should sound really good when mated up with the pair of woofers. Just as long as I don’t completely screw up doing the crossovers, I think we’ve got a great set of speakers in the making. More to come! Getting new speakers and crossover parts is always fun. This will give you some idea into the crossover I’ve concocted up. The cutouts in the walls of the basement where the Left Center and Right speakers will soon go. This entry was posted in Audio/Video and tagged , 18dB, butterworth, crossover, custom, dayton, design, DIY, home, measure, morel, octave, response, theater, zobel. Bookmark the permalink.